Might be multiple shooters and multiple mosques. Such a tragic situation. This is disgusting. Its not just Trump those guys elected all over the world. Those poor people who loved and were loved and who deserved peace. *Wanted to post it somewhere. I'm a bit younger than you and I ask, "how do you still do it every day?" All this murder and hate makes me feel three decades older. But this is also a Facebook, Google, Twitter, etc. problem. Those American corporations profit from curating the kind of hate that helped lift Trump into the W.H. The issue is bigger than Trump and the GOP. MSM is going to misconstrue a lot of his manifesto. I went through a lot of it and its littered with memes and internet jokes. However the underlying racism and (bleep) up views on ethnicity aren't coded at all. 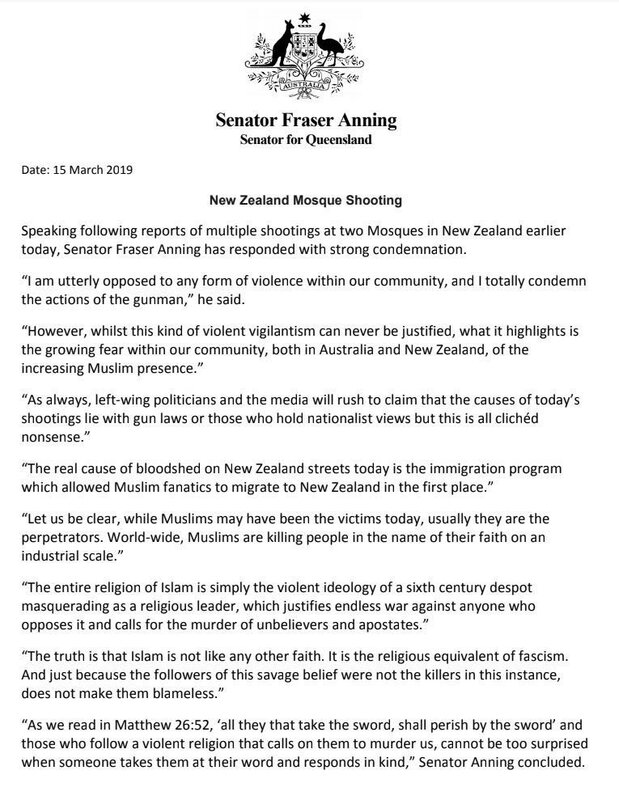 Anning was elected in 2017 to represent a rural area of Queensland, and has a history of making inflammatory and racist comments. He was kicked out of his political party in October 2018 after he made an immigration speech in August questioning Muslim and non-English-speaking immigration, and called for a “final solution” to the problem, an apparent reference to Hitler. I'm not familiar with the true teachings of the Muslim religion. I'm not sure many here in the forum are. I've never read The Qur'an. How many in the forum have? It's time to stop hating a religion we have no understanding of. They prey on our Amygdala. all im gonna say is im gonna start carrying to protect my family. im not pro guns, even after watching despise the second amendment more. but these terrorist acts are becoming to frequent and often. if there are people out there who are targeting children and other peaceful people, im not gonna run to a corner and become another stat, gonna shoot back. ^^^^ The Wild Wild West. Not good. Don't let those who want this win. If you start to carry for protection you will only put you and your family in more danger. I agree with you and you are 100% in the right. Its just that we live in a society that doesn't make the strides to put a ban on ALL firearms. That same society allows a need for home protection. I'm from the school of banning weapons made for war. Who needs a Uzi, Ar-15 and such? Have you seen THIS. A man with his child on his chest a women with children's stroller walking around in the same area that shows a man with a high power rifle strapped to his back. We can't come to that. Where are all the politicians to condemn Anti-Muslim violence? Are they not allowed to condemn anything except Antisemitism? The bad thing is that if there's a "sleeper" in NZ, he'll probably try to respond in kind. Another vehicle ramming or targeting a concert or something. This sh only perpetuates blowback, which is probably an objective of the hick who did this. Common citizenry are the ones who will suffer for it.